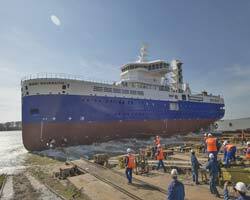 Bibby Marine Services has announced the completion and launch of its first commissioned vessel, in the form of the 90m loa, Damen-designed service operations vessel (SOV), Bibby WaveMaster 1. Built at the Damen Shipyards Galati facility in Romania, the 2,400dwt, walk-to-work (W2W) system-equipped vessel is scheduled for handover to Bibby in August this year, whereupon she will commence work related to offshore wind farm construction, maintenance and support, as well as providing accommodation for turbine technicians, in the North Sea. From original plans to accommodate 15 members of crew and 45 turbine technicians, the completed Bibby WaveMaster 1 now has the capacity to accommodate up to 90 persons in total, spread across 60 en suite berths, replete with access to TV and Wi-Fi. The SOV has a total deck space of 470m², including workshops and a covered storage area for turbine equipment, as well as a 12tonne-capacity helideck, a daughter craft (for transferring technicians to the turbine in calmer weather conditions) and crew transfer vessel (CTV) landing points. The SOV features four Caterpillar gensets – including two 3516 units, rated 2,265kWe apiece, and two C32 models, rated 952kWe each – as well as two fixed-pitch, nozzled, azimuthing thrusters, rated 2,150kW each. Three bow thrusters have been installed, including one fixed-pitch, nozzled, retractable thruster and two fixed-pitch tunnel thrusters, each rated 860kW. The vessel is certified to DP2 status. The vessel can store up to: 1.13 million litres of ballast water; 545,000litres of fuel oil (for vessel service) / 345,000litres of fuel oil (for cargo); and 180,000litres of fresh water (for service) / 430,000litres of fresh water (for cargo). Bibby WaveMaster 1 is now undergoing sea trials, in advance of her August delivery.